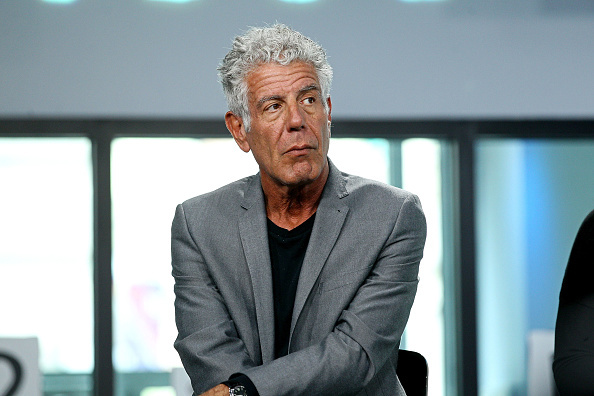 Our collective hearts broke with the loss of Chef Anthony Bourdain on June 8th. His death hit me pretty hard; I could feel the sadness in my bones. As a world traveler and journalist myself, I looked up to Bourdain. He inspired me to share stories, eat my heart out, and flirt with adventure. I owe my insatiable hunger for the unknown to him. I consequently took two days off from writing and photographing to reflect and mourn. On the third day, I got on a flight to Rovaniemi, Finland, a short solo trip I had planned for some time. I have been traveling by myself since I was 12 years old when my parents put me on a plane to play music all over Eastern Europe. I now travel for a living, splitting my time mostly between Paris, Seoul, and Seattle, but constantly catching a flight to somewhere new. However, this trip felt different — for the first time in a long time, I felt nervous about traveling. I left my apartment for the airport, suitcase in tow, and I immediately began missing the comforts of my pillow and the safety of my Parisian apartment. On the plane rides over from Paris to Helsinki then to Rovaniemi, I reread parts of Bourdain’s A Cook’s Tour, gave myself a much needed pep talk, and decided to transform my newfound uneasiness into curiosity. Right there in seat 4D, I decided that I would celebrate Bourdain’s legacy the only way I knew how: I would explore Rovaniemi with open arms, the way he would have. I wanted to ask questions that I would have usually been too shy to ask, befriend locals, try new foods (I’m an incredibly picky eater), celebrate every bite of the good stuff, and truly appreciate the local culture. I was greeted at the airport in Rovaniemi by a Finnish lady named Salla who acted as my guide. She would serve as my translator if needed and give me insights into how the locals live. Quickly into our relationship, I learned she had an infectious laugh, loved Pitbull (the musical artist), and really liked to eat salmiakki, a Finnish salty licorice. Our first stop was to Arktikum Museum of Science, where I toured the museum with a guide named Frank. We had originally planned for an hour long tour, but because I was asking so many inquisitive questions, the tour was quickly pushing towards three hours. Frank taught me about the Sami people, who were indigenous to the area. He explained how the details of their intricate clothing represented the location of their homes, the number of reindeers they own, and more. I learned a lot about life in the Arctic Circle, but I also learned a lot about Frank, who turned out to be a Dutch adventurer and academic who had once lived in South Africa. 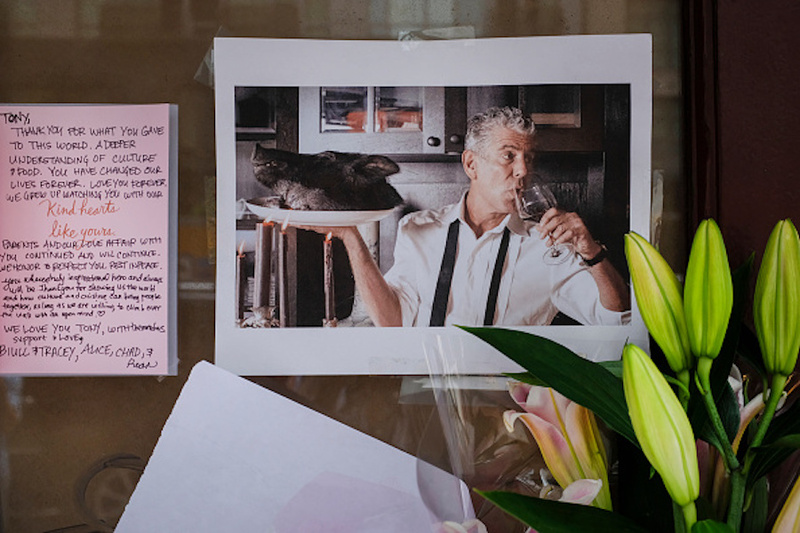 As a journalist, part of my job is asking the right questions, but I rarely pushed for connections like Bourdain did. I tried it with Frank, and it felt nice to genuinely befriend each other. We exchanged email addresses and promised to keep in touch. That night for dinner, I ate alone at Frans & Cherie, a French-inspired Finnish restaurant. I am based in Paris, so I’m obviously familiar with French food, but I have never tried French Finnish food. I love dining alone because it gives me time to relish what’s being served to me and enjoy every bite. But I must have looked a bit lonely; my server continuously checked in on me and explained every detail of what I was eating. She even offered me a nonalcoholic blueberry cocktail, which I took without question. I savored every drop of the concoction she’d prepared, knowing that locals had worked hard to pick these berries by hand. For dessert, she brought over another local specialty, leipäjuusto, which translates directly to “baked cheese.” I learned that it’s made from a “squeaky” cow cheese that can easily be acquired at the grocery store and baked in the oven with cinnamon and garnished with cloudberry, a berry indigenous to swamps of the Arctic Circle. In the summertime, the Arctic Circle experiences what the locals call endless light — they literally have sunlight for 24 hours. It’s a bit confusing until you really experience it. I returned to my empty chalet, stomach and heart full, laid my head to rest and fell asleep with the sunlight gleaming through the blinds as the rain clouds gently rolled in. On the second day, I had a busy morning of visiting the local landmarks. While stopping at a hotel for a quick snack, I recognized Chef Matti Eemeli Seitamo of Arctic Boulevard fame, celebrated by the food community for cooking Arctic cuisine, sitting on the indoor terrace. I yelled a “Hi, Chef” across the room and was greeted with a warm smile. I shyly walked over and asked if he could answer some of my food questions. He told me stories of pickling and preserving foods for the winter, going into the forest to collect mushrooms, looking through his grandmother’s recipes, and learning from the regional expertise of other chefs in the area.. I realized then how little I know about the world even though I travel for at least six months of the year. Matti and I decided to follow each other on Instagram, and now I get to see all the new dishes he is creating for his new restaurant in the Arctic Circle, Plan B. That night I had dinner at Hostel Cafe Koti because I was told the young chef there offered an affordable fine dining experience. I ordered the pork belly, something I would have never ordered before, broccolini with popped chickpeas, and homemade Finnish bread. The chef actually brought out the food with the server, who extensively explained which local produce was used to create these dishes. After eating, I felt this sudden urge to walk into the kitchen and thank the chef — so I decided to act on it. I stormed past the bar and into the kitchen, asked for the chef, and introduced myself to Chef Elmo. We shared stories about our mutual love for food; I asked for a dessert and he made it in front of me, explaining that the locals use edible flowers in the recipe. I returned to the table with my dessert in hand. Afterwards, I met up with a Finnish photographer named Juho to chase the midnight sun. We drove for miles to find the perfect spot to witness the sun go down but come right back up in this summer of endless light. Instead of thinking about the things I had to do, I let myself really be present. On my final night in Finland, I went midnight sun floating in the lake so I could fully experience Finnish nature. I signed up for a tour even though I had spent most of my trip fund on food and secondhand souvenirs. My guide, Martin, picked me up with another tour participant named Samuli. Both were studying tourism — Martin, a Bulgarian graduate student, and Samuli, a local undergraduate student. In the car, we shared stories about our homes and cultures, all of us amazed by how different yet similar our lives are. Martin took us to a cabin in the middle of nowhere, and the silence of our surroundings almost physically hurt me. My body wasn’t used to this foreign auditory sensation, so I struggled to adjust to the new environment. We suited up and entered the lake as instructed. In the middle of the lake in my neoprene suit, I took in the fresh air and reveled in silent nature. I decided to leave my problems and worries there, in the middle of the lake, and return to Paris a bit more carefree. 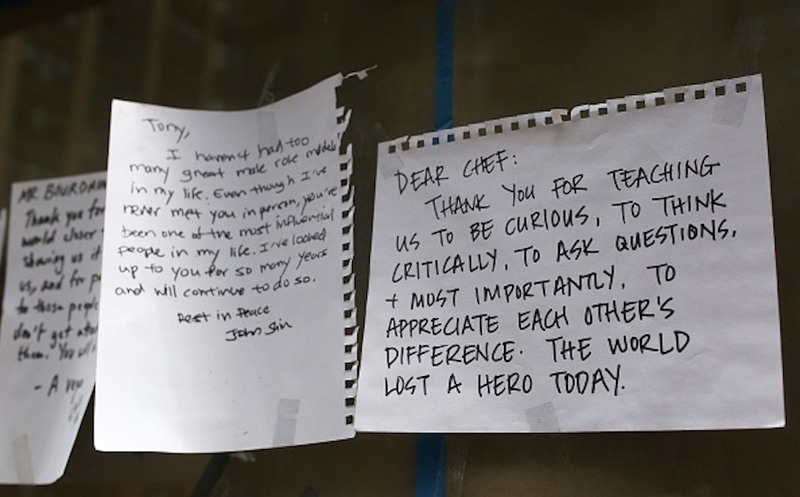 President Barack Obama was right; Bourdain taught us about food, but he also taught us that we have so much more in common than we think. In three days, I experienced more than I could have ever hoped for. I left Rovaniemi with new friends, lots of new stories to tell, and a new appreciation for travel. Here’s to searching for the perfect meal and exploring parts unknown.